Mixing lecture and project-driven learning, students in this course learn a framework to solve real-world problems with code. This course will give the skills you need to become a junior developer, jumpstart your career or launch your new startup idea. We work with some great partners to provide financing options to our students, including a 6-month deferred payment option that allows students to make no payments until after completing the course. Qualifying applicants can: Cover your total course fees; choose a term of up to 60 months; or pay early with no penalties. Traditional term loans are also available. What do I leave the course with? What will I have accomplished? By the end of the course you’ll have completed several individual and group projects, culminating in one primary portfolio project. Your portfolio project is your main showpiece that you will complete during the final two weeks of the course, but all assignment work can also be expanded and leveraged when demonstrating your skills and learning curve to prospective employers. You’ll have become friends with your amazing classmates and cultivated relationships with incredible mentors. If you make the most of the career support and networking opportunities, you’ll also leave the course with a network that will help you get started. This course will help you develop foundational skills to enable you to continuously learn and add new skills. Every new job, even within the same technology set, requires developers to relearn many skills. You’ll be prepared with the core knowledge you need to make these leaps. 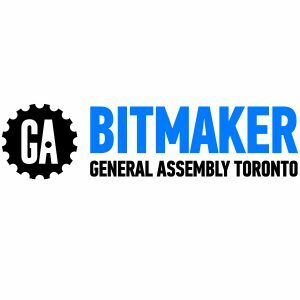 What post-program support does Bitmaker General Assembly offer? We offer extensive career support after the program, which includes a demo day showcasing your portfolio projects. Our career support team is here to mentor you as you are searching work and help you get your foot in the door with warm introductions to our extensive network of partners. Additionally, we offer alumni office hours to Web Development graduates in order to provide support as you continue to learn new skills. Our doors will always be open to alumni and we want to help them success however we can. Can I get to Bitmaker General Assembly by way of public transit? Our downtown Toronto campus is located at 220 King St West, which is very close to St. Andrew Station and the King streetcar. We’re also a 15-minute walk from Union Station if you are commuting on the GO network.